Our goal is to constantly craft new Internet marketing strategies to drive traffic, increase conversions, and broaden your online presence. Stimulate traffic with SEO, PPC advertising, and Social Media. Build your online reputation image. Stay above your competitions with SEO services (search engine optimization), and be the authority in your industry. Build a profitable PPC campaign by selecting the right keywords, budget, demographics, and geolocation. Keep your business visible in your audience’s inbox. We have the best email marketing tools and strategies to create and track professional and effective email campaigns. Your audience is increasingly connecting to Social Media networks. Be Where they are. Our Social media marketing services connect you to your audience and communicate with them. The art of converting Website visitors into loyal customers. We increase the conversion of your website by simplifying the user experience and invitations to easily take action whether to purchase or to engage them to answer their questions. Generate brand awareness with our Display Advertising Service. A perfect mixture of creative graphic design and strategically chosen keywords creates a master piece of a display campaigns. Our primary goal is to deliver a strong ROI for your marketing campaign. Since every business different from each other, there could not be one cookie cutter solutions which we can apply for all businesses. In order to trace a unique path for your company’s online success, Our marketing strategists need to get a thorough understanding of your business by immersing themselves into your company understanding your company’s brand, industry, culture and competitions. Our marketing strategists will then perform an in-depth research including a comprehensive review of your website’s analytics and it’s current online position. We will then perform competitor analysis, keywords research and check the quality of your back-links to your website. We use all of these findings to create an framework and a clear set of online marketing guidelines and recommendations for your company’s online success. Selecting the right audience is very crucial in creating a successful online marketing campaign and maximizing your company’s ROI. We will focus our online marketing efforts on creating a specific audience of users who expressed interest in your types of products and/or services. Once the right audience is identified and created, we will then direct the attention of these users towards your company’s website converting them into your loyal customers. After directing the traffic of your audience to your website, visitors will be encourages to take action to interact with you and ultimately purchase your product and/or services. Our focus will then be to make certain that your audience will takes an action, whether it be to communicate with you by submitting a form, subscribe to your newsletter, like or share your content on social media, make a purchase or some other desired actions. whether your website visitors have been converted into a customer or not, it is extremely important to remain in communication with all of them. Most website visitors will not make a purchase in the first visit. 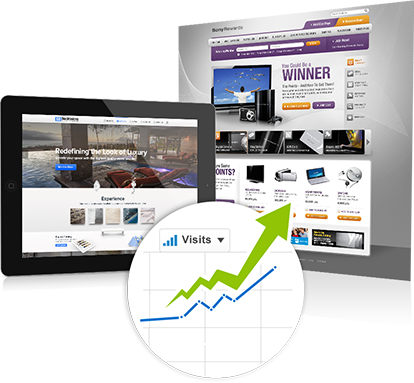 We use remarketing technics to engage them and be on their radar screen.